Anyone who knows me, knows about my limited and exacting taste in art. With a few exceptions there is little made after 1900 that I find meets the criteria for a masterpiece. And don’t get me started on Dada. But occasionally I surprise myself, and find beauty in something against my better judgement. Some of Mark Rothko‘s works are proof of my unexpected wavering. Black on Maroon (1958) in Tate Modern ranks up there with some of the most memorable experiences of looking at art (perhaps only second to Caravaggio). I remember first seeing the painting while at college, and immediately found that it spoke to me. Although I don’t go to Tate Modern very often, I can see the painting in my mind, and recollect the feeling it evokes in me. As with all art, it is hard put context to one side, in Rothko’s case, his suicide. 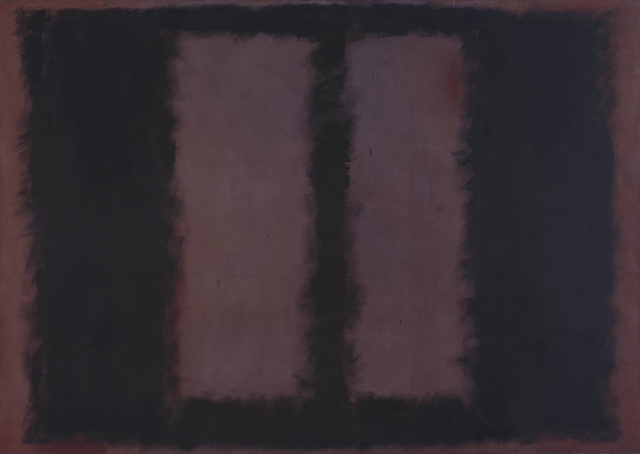 But when I first saw the painting I knew nothing about Rothko, and I feel the same emotions as I do now when I see it. Housed in the Rothko Room, six of the nine canvases owned by Tate create an amazingly peaceful atmosphere. I find it extraordinary that the series of paintings to which this belongs was originally commissioned for a New York restaurant – for which Rothko went onto produce 30 in total. I can’t imagine sitting amongst them, enjoying a meal, the sounds of chinking cutlery and chatter in the air. To me the paintings emit an almost sacred aura, the kind that would not be out of place in a church. Of course they could be seen as purely aesthetic thing, experiments in colour and form. But looking upon this painting I feel enveloped, suppressed, almost suffocated by melancholy. And this forces me to look inward, to meditate on my own thoughts, alone and undistracted. The abyss-like black and the rich reds from maroon through to crimson speak to me of hopelessness, perhaps morbidly, blood, mortality and death. But more than that this and the other paintings in the Tate communicate something that words cannot, which is strengthened by seeing them in a series – large and imposing. Thinking about it here and writing I struggle to articulate what it means to me. Whether all this is what the artist intended, I don’t know, but my point is, does it matter?